Tried And Failed To Get Rid Of Stubborn Rust? Rust Off starts dissolving rust on contact. Absolutely no scrubbing is necessary, just apply the Rust Off to any surface that has rust and you will see it disappear as you are watching. Items that can be soaked in our Rust Off rust remover come out looking new, completely rust free in just a matter of minutes. Larger items may require a bit more time. Hunters or gun owners can use it to clean the rust spots from guns, a big problem in gun world. Fisherman can clean their hooks and lures with Rust Off before fishing. Rust is a major problem and other than replacing a fishing lure, simply soak it in Rust Off for a new, clean surface. Mechanics can soak the parts they remove while they are making the repair. As they replace the parts they will be clean and "rust free" as if they had bought new, making their work look even better. Bike owners know that their bikes or their children's bikes are always being attacked by rust. By soaking a bike chain, for example, in the Rust Off rust remover, you can make the chain not only look new but greatly improve the performance of the bike. Motorcycle owners are very susceptible to rust. Every motorcycle owner will benefit from owning a bottle of Rust Off, especially motorcycle repair shops. Painters see rust just about every day. Wouldn't it be nice to just spray the Rust Off on and wipe the rust off? Of course it would, especially when painting metal objects where there are always rust spots. 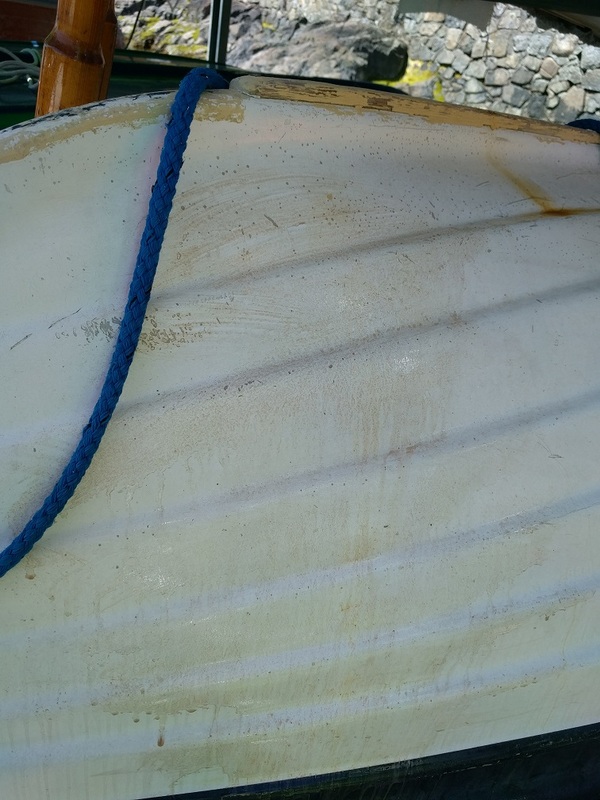 Boat owners know that where a metal rail or screw meets the fiberglass there is often rust staining. 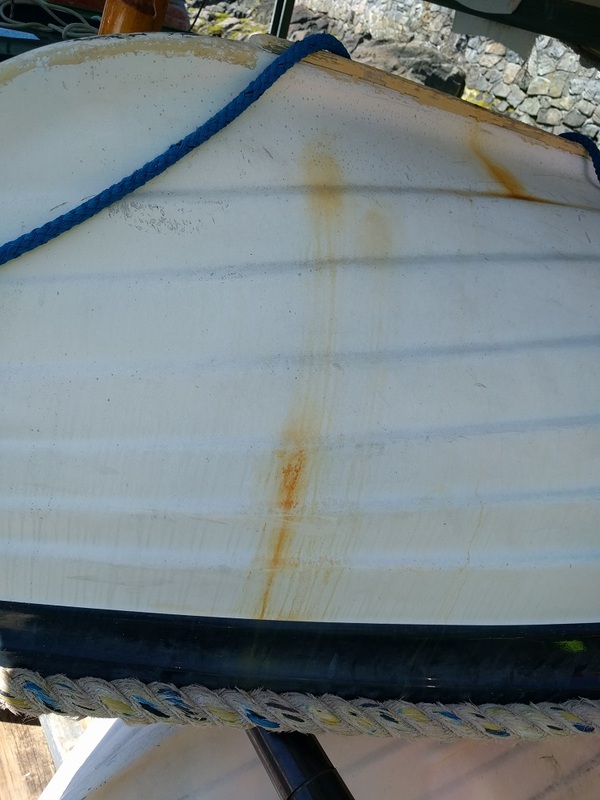 Fishing gaff's are always rusty, and boats owners are constantly battling rust, especially salt water boats. A number of months ago I asked you if the Rust Off would work on asphalt shingles. We tried it and yes it does remove it. We have a problem here where roofs are rust stained from furnace fumes coming up the chimney. It appears from the ground that the rust on the roof is actually coming from the selkirk chimney but upon our inspection there is rust on the high side of the chimney also and of course rust does not fall up from a services, just down. This is quite ugly on a roof especially if the chimney is at the front of the home. Imagine a $300,000.00 home with all it's beauty and a rust stain. When IKO are testing it would make sense to try removing rust stains from the shingle. A huge market here. No mixing just use full strength, spray Rust Off on a rusty surface and wipe clean with a dry cloth or wash off. If soaking a rusty item, submerge it in a container of Rust Off and you can watch the rust deposits break down and dissolve. Remove when rust is gone, usually within minutes, (items with heavy rust may need to soak longer, sometimes an hour or more), then remove and wipe dry. Always coat with a rust inhibiting lubricant to prevent recurrence unless you are painting. Our retail dealers are listed on our website or you if there is none close to you it is available on our website. If you are using Rust Off for tools, nuts and bolts etc, just pour some into a can and let them soak, the pour the Rust Off back into the bottle. It can be reused until it stops working basically. 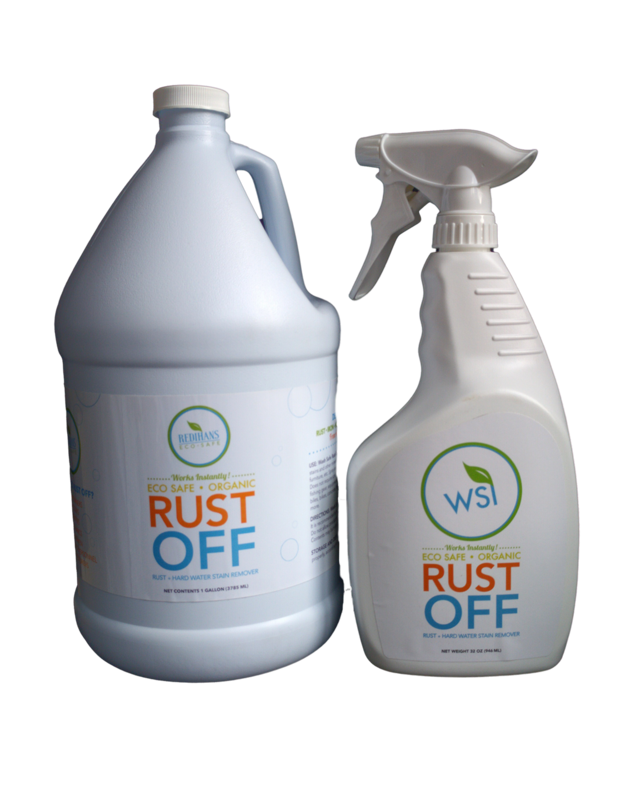 If you are spraying it onto rust, you will find the rust almost "liquefies" on the surface and then you wipe it off with a rag, but if it dries it will solidify and again look like a rusty coating and you will need to spray it again. Keep in mind, Rust Off doesn't work as a rust inhibitor so you need to put some sort of protective coating on after cleaning. Good luck with your project. Hi Debbie ... thanks so much for your inquiry about Rust Off! I too love collector cars. I have a not so old 1989 Benz 560 sl in the garage for driving on sunny days (if we ever get any here in Vancouver). I chose this Benz because it was the last model year before they radically changed the whole chassis. It is still a "finely engineered motor sports car" but then they went big in 1990. My experience is that Rust Off will indeed take off surface rust. 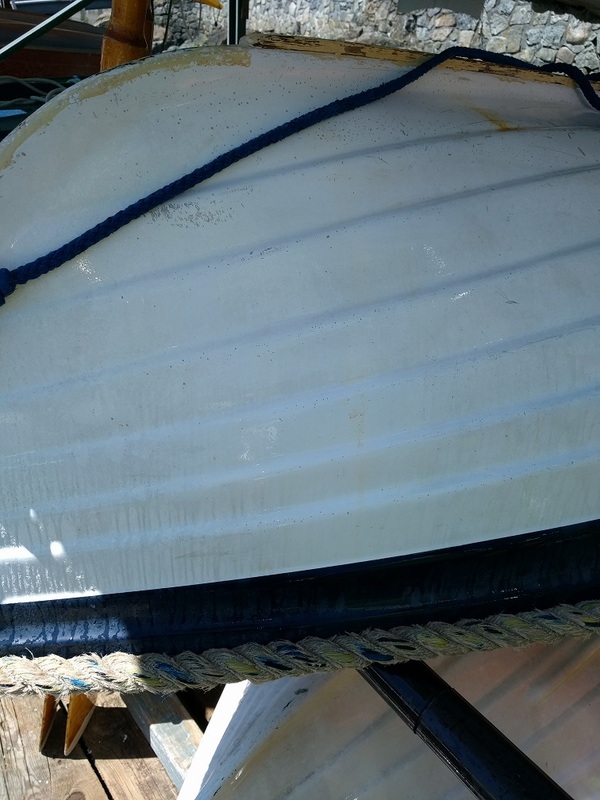 My cautions are that if the rust has pitted the metal, the pits will still be there but the surface will be a dull grey/silver when you are finished. After you wipe it off or wash it off with water and wipe it off you will still need to coat it with something as it does not inhibit rust. We have after market auto shops that fill a bucket with Rust Off and simply drop rusted parts in and leave them until they come out clean, coat them with some sort of lubricant ... I use WD 40 but that is definitely not for parts that will be painted ... a body shop owner told me paint will not adhere to WD 40! Its worth a try but each job is different. It takes rust off the "dings" in the box of my truck, garden tools, hammers, wrenches, but you need to try it. It is ok to be painted after the cleaning. I sprayed it on a pair of tin snips and did not wipe it off and the rust just settled on the surface like brown water ... dumb ... follow the instructions Doug ... I re-sprayed it, wiped it with a cloth and all was well. (I think Debbie’s email back is worth sharing...) "Hi I'm sending a cheque as I got my Rust Off today and I'm so excited! It ate the rust off these bolts in less than 5 minutes. My two ashtrays were all mangled and thickly coated with rust and now they are almost new! I'm going to need some more but I'll play with this for a few days. I'm going to put it in a plastic tote so I can just keep adding parts. Thanks a bunch! By the way I'm a barber...how many guys do you think will love this stuff ... almost all!"